In part 1 we heard how Derbyshire based Colin Yallop of Chevin Audio is not only the appointed UK agent for Allen Wright's Vacuum State Electronics modification service, but is also able to modify other cd players not yet within the VSE hierarchy of standard packages. The VSE level 5 modified Sony CDP555es certainly impressed Mark, but both David & Mark want to establish how transferable Colin's skills are to the widest possible range of players. A current favourite and an ageing classic fit the bill, offering Colin the challenge of old & new as well as the diversity of trendy Chinese tubes and Japanese bitstream already in a factory premium version. Although these are not within the usual VSE stable of modifications, they do apply similar thinking to reducing the problems typical of mass-produced cd playback equipment. Here it is Colin's own expertise under the limelight as there is no standard package of modifications available and no accepted hegemony. One or two companies, like PartsConneXion in Canada have offered an upgrade service for the Shanling CDT100a, but Colin had not seen inside a Shanling CDT100c before and spent time scrutinising the circuit observing the design and its compromises. The first thing he notices is the proprietary clock incorporated in the Shanling's chipset and the second surprise is no less than 3 op amp chips between the DAC and the valve (tube) output stage. 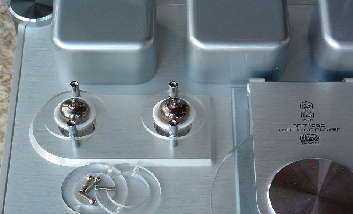 Colin also notices the valve output stage runs both triodes in the glass envelope in parallel configured as cathode followers. Cathode followers take the signal from the cathode (rather than from the plate in a conventional amplification stage) to provide a very low output-impedance unity gain stage. Unity gain means the signal out is equal in voltage to the input and the low impedance means the stage is better able to drive long cables or awkward cable or amplifier input impedances. It is a good engineering solution to the role of output stage, although some argue that the 100% current feedback (that results in the amplification factor of 1) involved is a bad thing. Colin reconfigures the valve output stage to a conventional voltage amplifying stage to replace some of the voltage gain that the 3 chips provided. This eliminates the current feedback but raises the output impedance, so it might now be more cable sensitive. Colin bypasses the three op-amp chips to enable this by taking the signal from the DAC via a simple analogue low-pass filter (the original filter being in one of the chips) comprising two capacitors and an inductor (choke). When Mark visits Colin's house to hear whether this is worthwhile a whole layer of grain has gone. The already natural sounding Shanling sounds even cleaner. Colin is keen to remove the upsampling facility, but Mark finds it useful on some discs, notably some of his favoured Arvo Part vocal recordings. Colin embarks on installing a new TentLabs clock, similar to those in the VSE upgrade package, but finds some residual jitter on test. Colin removes the Shanling's headphone amplifier (also valve) and replaces the 1/4" jack socket with a phase-invert switch. Mark takes the player away for an extended audition to learn how each modification affects the sound, promising to return it to Colin in a few days. Back in Mark's system the modified Shanling CDT100c is in a new league. Often described as a bargain entry to the high-end in reviews in the [English language] hifi comics, this status is now confirmed. Layers of grain and opacity have now vanished from the analogue domain. The digital domain is now more exposed and some typical low-level jitter artefacts remain detectable. It is difficult to ascertain whether the increased transparency has rendered these more obvious as the measured jitter is much reduced. There are papery uncertainties in high-frequency timing, not unlike low-level flutter in high-speed reel-to-reel tape recorders, but it is an order of magnitude better than the original. Colin had already warned that he had not yet reduced jitter to the levels he aims for, but Mark wanted to report on the work in progress. Mark is curious to learn whether these are jitter artefacts or caused by vibration effects. Regular readers will know of his obsession with vibration effects in audio systems and Ed Meitner of EMM Labs has reported research on silver disc's vulnerability to vibration effects after bombarding cd players with noise in anechoic chambers and measuring the results. "Put a CD player into an anechoic chamber, in front of a loudspeaker, and sweep frequency you will find a really vicious peak in the focus servo current around 800Hz, very high Q. The disc resonates and the focus wants to follow it. This current demand modulated the power supply and generates jitter, which is influenced by the acoustic energy going to the CD player from the speakers... Since it's around 800Hz, we have this problem with female voices, if you know somebody who can sing in that frequency range, very loud, they can shut CD players down... Once you are talking high velocity vibrations, as they are at 800Hz, clamping doesn't change things much." A timely reminder that cd players must be well supported if they are to perform at their optimum, regardless of their modification status. Meitner has measured vibration effects in controlled conditions and seems to have experienced similar effects to those I am hearing. The Shanling gets returned to Colin who remains concerned at that residual jitter and the hum levels from the new output stage. 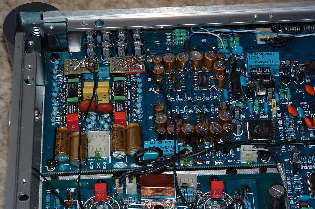 Colin improves the power supply to help both problems and removes the cathode resistor bypass capacitors to reduce the gain in the stage, and uses half of each 6N1P double-triode for gain and the other triode for cable-drive. On its return the Shanling demonstrates even more of the high-end taste for which it has garnered such a reputation. Colin still believes the VSE Sony to be a much superior package, and Mark can hear his point, but a new Shanling CDT100c plus modification package is much cheaper than the VSE Sony equivalent so that's no real surprise. The modified Shanling does still have a residual hum problem that only manifests when a disc begins to play, suggesting it does not arise in the new output stage, but earlier in the electronic chain. It is no worse than the low-level hum of a good moving-coil input, and at it's lowest when the digital volume is set to "max". Colin also installs a couple of different dampening materials to different parts of the chassis. I've been asked not to reveal their identity but I recognise them and approve of them as materials that have tested well for me in the past. Colin also creates a tube dampening ring that supports the glass envelope against the perspex ring of the Shanling's valve protection cage. This is a clever way of dampening valve microphony and potentially more effective than most self-supporting "tube dampers" [sic], though why those latter products advocate moist valves is a moot point! Compared with the standard player the modified Shanling has removed several opaque veils that used to obscure the subtle nuances of reproduction on the factory product. The portrayal of rhythm is much more convincing, and more likely to inspire listeners to dance. The Shanling's pace remains slower compared with the Avondale and perhaps slightly behind my old Bitstream Rotel, but much better than it was. The Shanling bass still sounds much weaker than the Avondale and poorly defined in comparison, but bass & pace are the Avondale's raisons d'etre. Timing, especially in the higher registers (like cymbal stick-work, snare rimshots & violin harmonics), is much more coherent on the modified Shanling than ever before. The Chevin Audio modified Shanling CDT100c excels in its portrayal of soundstage and realistic human voices. Female voices are sublimely natural and convincingly embodied. Soundstage is wide & deep and even occasionally tricks listeners into imagining height too. Best of all, soundstage positions remain constant throughout instrument and vocal registers, there's none of that wandering about as notes get higher. Mark doesn't care for so called pinpoint imaging but wandering instruments are so disconcerting he'd rather have good mono. The Chevin Audio modified Shanling satisfies with a flattish stage populated by a coherent spread of performers who stay still while they play. One disadvantage of this modification architecture is that is puts the principal analogue gain block last in the reproduction chain before the output sockets. This means there is an inevitable increase in noise (mostly ripple noise), especially when the player is used alone without a preamplifier. When the Shanling's remote operated internal attenuator is used at anything less than maximum volume there is a noise penalty, which becomes worse at low volumes so buyers of these modifications will have to use a pre-amplifier or passive attenuator. The Shanling's digital domain attenuator is one of the most transparent Mark has ever heard, so this might be a disadvantage in cd only systems without pre-amplifiers; Mark recommends a variable transformer as the most transparent alternative. David and Mark are both also the proud owners of these classic bitstream Rotels, Mark's being a UK spec Discrete. But first a bit of history about this old Rotel player. David is not a great fan of CDs, but used a NAD 524 for some years. He found it fun, but not terribly accurate, and was pleasantly surprised by the increase in subtlety when he moved over to Rotel CDPs quite by chance. David bought an old RCD 865 for a family member, and then, hearing good things about the 965BX, He bought a nice clean example from a dealer a year later. He was always a bit disappointed by this machine as it lacked the smoothness of the older 865 and sounded a bit too bright. David retired it to the living room for general family use, and kept the 865 for the rare occasions that he played CDs. Chevin Audio offer interesting CDP upgrades and note that the standard 965 was one of the Rotels that they believed could be significantly improved. David contacted Colin Yallop and discussed the mods listed: mainly clock, caps, opamps and resonance control. The name of the game here is cost-effective mods, not the more complete rebuild that, say, the replacement of the DAC would involve. A TNT friend of David's, Tom Browne, commented that these were sensible mods: because this player has a 1-bit DAC, clock quality is critical to overall sound quality. To preserve TNT's independent stance, and respecting the fact that Colin is a one-man business, David & Mark offered to pay for postage and parts. David's player was duly posted off. He told Colin that there was no hurry, but Colin still worked on it pretty quickly and the player returned with the promised mods within a month. 1. Colin replaced the original master clock with a TentLabs XO low jitter master clock. 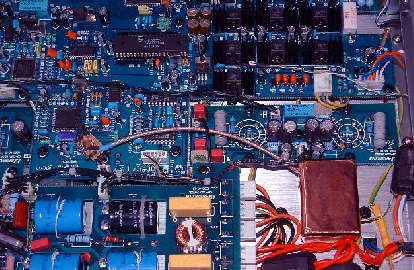 This was installed as close as possible to the player's clock input circuit so that jitter picked up the clock signal wiring would be kept to a minimum. 2. 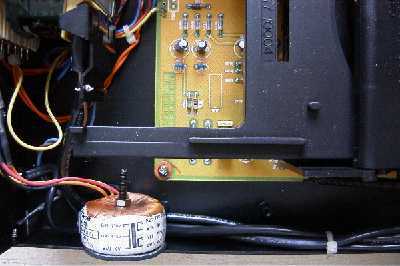 Colin supplied an ultra low noise Chevin Audio design power supply to feed the XO clock to realise the full potential of the clock. For maximum isolation between the clock power supply and the player's main supply, this power supply has its own mains transformer. 3. 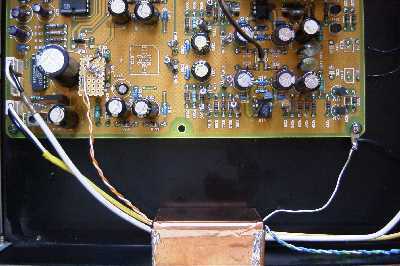 To further reduce power supply noise in key areas over a wide range of radio frequencies, he also inserted ten additional power supply capacitors. These supplement the original Black Gate capacitors in the player which reduce noise mainly at audio frequencies. 4. He replaced the stock audio output opamps with very high performance alternatives, and added circuitry to bias these into class A at all times. 5. To reduce microphonic feedback from speakers to the player's circuitry, he laminated the sides of the player with 3mm thick resonance controlling material. There is not sufficient space inside the player to the same to the lid, but he recommended the use of a piece of MDF or similar should be placed on top of the lid. David has not tested this yet. To further control resonance he also removed the rubber pads in the feet. 6. As a nice final touch, Colin also replaced the audio output coax wiring with fine ptfe twisted pair silver plated copper wiring. This was a nice additional touch to squeeze the last drop of improvements out of the upgrade. When the player returned David was eager to listen to it, but worried that he'd not be able to notice a difference. There was no way of doing a before and after test, and memory can play tricks on one. David was interrupted while setting it up and wired it up to the preamp incorrectly. The first sound he heard was not nice, but that was his fault! Sorting this out, and hoping that he'd not damaged either the player or the preamp, David settled down to listen carefully. The first thing he noticed was that the output signal was stronger-the preamp volume control had to be turned down a touch from its normal position. This was not significant. Then he found that the player played music in a way that interested him - that he could relate to. He can't give a technical description of what has changed and he wants to emphasise that basic character of the sound of the player has not changed. But, it sounds better all round. The main proof of this is that David began to spend whole evenings listening to CDs instead of getting restless after about ten minutes. David started having a CD storage problem and worried for a bit that his turntables might start gathering dust. Sometimes he caught himself reaching over to the turntable to change a track, only to be caught up short: there was nothing on it, it was a CD! David's not saying that this player sounds like vinyl. It certainly doesn't sound like a mid-fi turntable. In fact, the older RCD 865 sounds more like that. This upgraded player now delivers more of the musical accuracy that David expects from a high quality turntable, and also adds some of the frequency range that is missing from vinyl. It still sounds like CD; the clinical edge is still there, but it has a musicality that was missing before. The above makes it clear that David does not have experience of high-end CD players and this experience has shown him that there is a lot more out there for to explore. But, of course, all that would come at a price. Providing a player has the basics; a reasonable chassis, transport, decoder etc, there seems to be fantastic potential for improvement. It also seems that the flavour of the final product can be tuned as readily as if designing and building from scratch. Previously we have heard Les Wolstenholme, a man of flat-earth credentials if ever there was one, transform a clunky old Arcam into a rhythm king, now we have heard Colin Yallop extract high-end flavours from mid-market ingredients. The Shanling is transformed from a player with hints of greatness masked by excess circuit complexity and power supply noise into a great player with stunning midband and expansive soundstage. The Rotel is rendered sufficiently musical for David to listen to whole cds, indeed sometimes several in succession, which is praise indeed. So, our recommendation is that if you have a good quality CD player that you like and which is, say, under ten years old, you should consider taking this upgrade path. We think you will get more for your money than selling what you have for peanuts and spending a lot on a significantly better player. Contact Colin and prepare to be surprised and pleased, and then enjoy spending the money you've saved on CDs. If trying to drag something tolerable from red book CDs is your goal, and high end flavours set your taste-buds ablaze, Colin Yallop's modification service is more cost effective than the endless upgrading cycles so many audiophiles suffer. We've both paid Colin for the work on our players and they're now reference players for silver disc in our systems.